Yet again, a perfectly healthy outdoor activity is being banned because of health and safety concerns. Now, students in Edinburgh, Scotland are not allowed to go outside to play during recess because there’s too much snow. Oh, and because wet boots make a mess in the classroom. While no sensible teachers would send students outside during whiteout blizzard, or expect them to blaze their own trails through six feet of snow, neither of these extreme scenarios seem to apply here. Like the recent apple bobbing ban in the UK, this ban on outdoor snow play only spreads paranoia while doing nothing to protect children’s health. But hey, someone might fall into a snow bank. Or slip on wet boot prints in the classroom. Or get socked in the face with a snow ball. Or catch a cold. Better to make them sit inside instead. 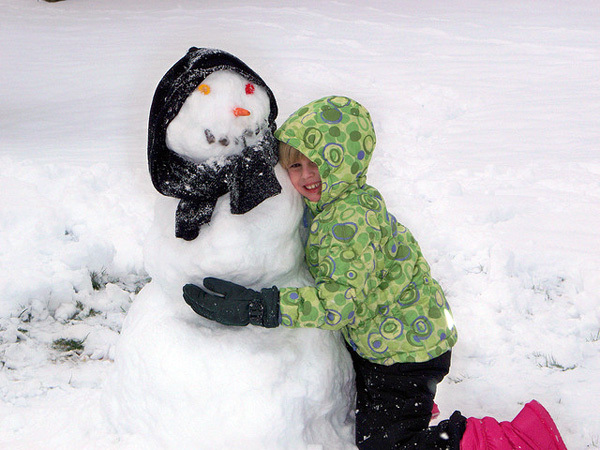 If we let kids outside to play in the snow during recess, they just might end up hugging potentially dangerous snowmen. Photo by abbamouse (cc). Thanks to Lenore Skenazy at Free Range Kids for alerting us to this story.